NEET 2019 State College Rank Predictor Software: Hello Aspirant of NEET 2019, as you can see from the website name our site dedicated to exam results. We are keeping our eye on all the latest news and happening in NEET and trying to provide information in easy and understandable language. In addition, our support team is 24/7 available for solving your query that you can ask in the comment section at the last of this article of using contact us form page. Today we will discuss the NEET 2019 State College Rank predictor and Rank predictor tools & software (Methods). 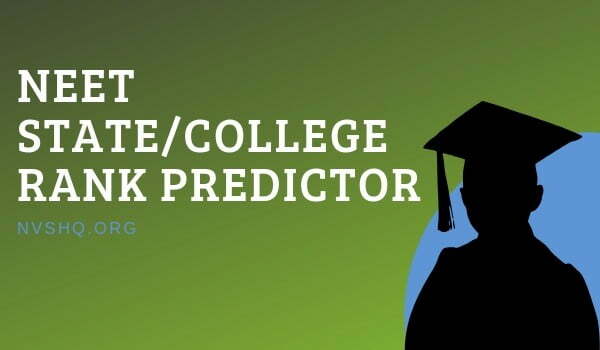 Before we go into details just too clear doubt, Rank predictor and college rank predictor are two different things. The rank predictor is for prediction of whether or not a candidate will qualify the NEET entrance exam. Whereas college rank predictor is a prediction, the college in which candidate will be eligible for counselling and admission. 1.3 How to Predict Your Rank? 1.4.1 What consideration is NEET 2019 rank predictor founded on? The rank predictor is the technique by which the candidate who appeared in the examination can know their rank before the release of result. One way is to check rank through answer key. NTA NEET 2019 Answer key will be published one or two days after the exam date. You can also check unofficial answer key, which is released by the NEET coaching centers and institutes. With the rank predictor, aspirants know about their score can get a fair idea of whether or not they will be sitting for NEET counselling of 15% All India Quota. Candidate must note that this is not final rank; they must wait for the official rank list release by NTA on the day result is out. Another method to predict your chances of getting to next set in getting admission medical or dental college is checking NEET previous year qualifying Marks. The qualifying mark is the minimum mark that candidate must secure in order to qualify NEET. Only after which you will get name in NEET 2019 Merit list. Moreover, to be eligible for NEET counselling rounds. Below is the list of previous year Category wise qualifying marks in percentile in tabular form. Yet another way to determine predict your NEET College & Rank is to see previous year NEET cut-off marks category wise. Students can check the below table for the cut-off marks. Cut-off marks is the least marks candidate must score to qualify exam and can proceed to next step i.e. counselling Rounds. How to Predict Your Rank? This step is valid only after you know the score. To know your marks scored that candidate can obtain by cross-checking their answers from the official NTA NEET answer key 2019. You will get a fair idea about the score you will get if you follow the right-marking scheme given by authority. Below is the list of mark scored and NEET rank in its correspondence. Look for the score you obtain and then look for NEET rank (expected) to predict your rank. Just to give an idea of how to predict college from your rank, below we have prepared the expected opening and closing rank that these college accept candidate for counselling round. These are the top medical college in India. To be noted that the table is formed from previous year data and should only be used to know how to predict any college. You can also follow this for any college, look for there previous year opening rank and closing rank online & compare it with your rank predicted earlier. What consideration is NEET 2019 rank predictor founded on? Predict: candidate gets tool or method by which they can predict there rank before the official release of result. Rank prediction is done on the bases of performance in the exam. Realise: It helps in know students stands with competitor. NEET 2019 rank predictor makes you realize the completion and prepare the student for upcoming situation. Get Insights: Rank prediction help candidate know the completion and where you stand. Also the difficulty level, candidate appeared, marking scheme, cut-off marks etc. Target: Ones the rank is predicted you can then target the right college based on it. The candidate may try finding opening/closing rank of colleges and comparing it. On the other hand, can be used to find whether to focus on next attempt. Hope you got the idea of NEET 2019 rank prediction and college prediction here if you have any query or doubt then you are most welcome to ask below in a comment forum. All the best for NEET 2019 Result!